Everybody loves a good lamb pie wrapped in puff pastry and this one is made with leftover lamb on the spit, a few days after Easter with the addition of leeks, spring onions, dill and graviera cheese, which is just delicious! Usually, as a big family, we don’t have a lot of leftovers. On Monday I prepared lots of food as it was my eldest son’s name day but none of my sons ate much, as they were not feeling well. On Tuesday I made a Lamb Roast, tabbouleh, tzatziki and a Birthday Cake but unfortunately again I had lots of leftovers as they DID NOT EAT. They were both not feeling well and the doctor diagnosed gastroenteritis. They are now feeling much better but they are still on a diet, so today I prepared four different meals. I prepared lappas, for one of them which is a soup with boiled carrots with rice, with a little olive oil, salt and lemon juice, as the doctor prescribed, which is good for the stomach, whilst my other son who is feeling better needed something light, but tastier to eat so I added a potato to his lappas as well as some fresh cod fish. Well as I said I had lots of leftover lamb from Easter in the refrigerator so I had to make good use of it. I made a search on the internet but I did not find anything interesting to cook with the leftovers. My husband wanted to go out shopping as he had to go to Athens later in the day for some other business and he was pressuring me to decide what to cook. I kept thinking and thinking and then I found the solution on my own site. I would make a Lamb Pie, based on my Meat Pie. My husband went out to buy some fish for soup for the boys and as I was preparing the pie he called me to tell me that he found some fresh anchovies called gavros in Greek and asked me if we wanted some for tomorrow. I could have said “no thanks” but it’s been a while that I wanted to make anchovies so I told him that it was a great idea but only ½ a kilo as the boys would still eat something light tomorrow. Of course that added some extra time in the kitchen as I had to prepare the fish as well. The pie I decided to make would be somewhat different to the one I usually make and instead of using ground beef I would use the leftover lamb. However, as I had so many things to prepare I would use ready made puff pastry instead of making the phyllo myself. Apart from all the above my daughter did not want to eat the meat pie so she asked me to reserve some leftover lamb for her as she planned to make something herself. In a non-stick frying pan, sauté the leeks and onions, with one tablespoon of olive oil until soft. Remove all the visible fat from the lamb and cut it into smaller pieces. Add it to the onions and leeks and season with salt and pepper. Remove the pan from the heat and set aside to cool. Mix in the dill. Cut the puff pastry into square pieces 15 x 15 cm and with a brush wet the edges either with water or olive oil. Place some filling in the centre and add a spoonful of graviera cheese on top of the filling. Join the two sides, by pressing together and then join the other two. You can leave them square or continue folding the edges towards the centre and make them round. Place them on an oiled baking tin or a baking tin lined with parchment paper. Beat an egg with a fork and with a brush glaze them. Preheat the oven to 180o C / 350o F and bake them for about thirty minutes or until golden on top. Gyros is a street food sold in Greece. Big chunks of meat are skewered on vertical skewer, which rotates in front of heat. When the outer layer is cooked, it is “shaved” with an electric knife. Pieces of meat are added in a Greek pita (flat bread) and served with tzatziki, fried potatoes, thinly sliced onion, tomato, salad etc. This is food is not easy to recreate at home but as a substitute you can used roasted lamb, chicken or pork. My daughter used the leftover lamb to make some gyros. She asked me to fry some potatoes. I prepared the pita for her by spraying some olive oil in a non stick frying pan. I let it warm up and heated the pita on both sides for a few minutes. She added leftover tambouli, leftover lamb meat, finely sliced, tzatziki and potatoes et voila. Each year I love making a lamb pie with out Easter leftover lamb meat. All these years I have not found the time to update the post but I’ve made this pie again with homemade phyllo from scratch with a different filling, which is similar to the one I made today but only with lamb and no potatoes. I did not take any notes on the amounts I used but this year we had some leftover lamb, a slice of kokoretsi and a few pieces of roasted chicken and roasted potatoes. Again, I removed all the visible fat from the meat and cut the meat and potatoes into smaller pieces. I made a small amount of bechamel (I used 50 grams olive oil, 50 grams flour, 2 cups milk and 2 eggs, salt and nutmeg), in which I added the meat and potatoes, I added two finely chopped spring onions, some dill and parsley (about 1/2 cup), 1 cup of graviera cheese and 3 leftover hard boiled Easter eggs, finely chopped. I used one sheet of puff pastry for the bottom layer, the filling in the middle and the other sheet on top. I baked the pie for about 35 minutes, until it was golden on top. 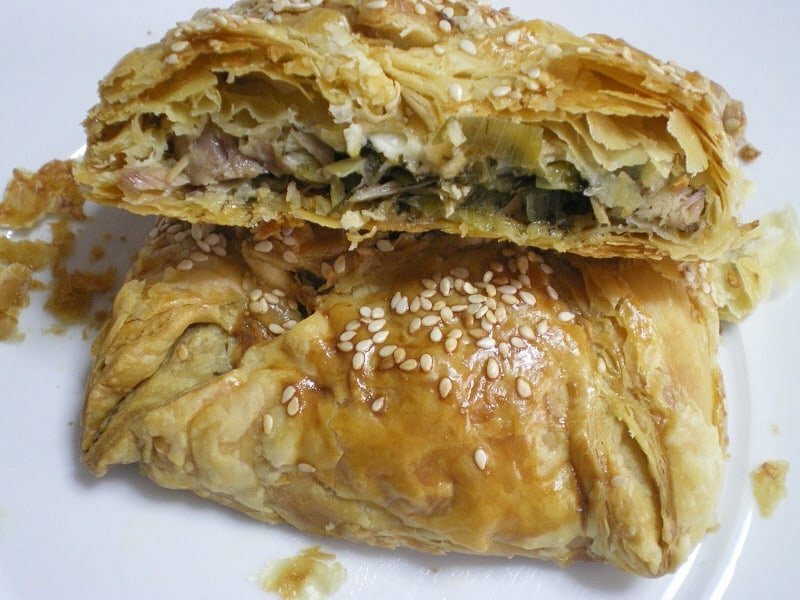 Although we love it with homemade phyllo, it is equally good with puff pastry as well. We loved the addition of potatoes and hard boiled eggs in the filling. Try it and I am sure you will love it! hi sweetie, you are so very thoughtful thank you! Great leftover dish for lamb, would fill our stomach with happiness! You are welcome Pixie and it’s well deserved. Hi Ivy…I tagged you on the 6 word memoir ages ago…It was here. Oh well…hope every one feels better after their gastro. Gosh, my first tag. Thanks, Ivy! Hmmm…thinking about how to describe myself…it won¨t be pretty! Thank you so much for the award, Ivy! You deserve every award you get. The lamb pie sounds great…of course. Your lamb pie sure looks great and I wouldn’t say no to that gyros either! I’ve never heard of graviera cheese so I’m now intrigued :). @ Peter: I am so sorry Peter, I forgot all about it. I explain why in the post. @ Lulu: Modest is one of them, find some more I am sure you can. @ Emiline: I enjoy reading your posts and of course you give us yummy recipes. @ Lore: Thank you Lore. Graviera is a hard yellow cheese but so tasty. Can I call you Panagiotis from now on? My Greek name is IVI (Ήβη) but when I went to the English school they used to call me Ivy, so I kept it when we returned back to Cyprus and they called me Ivy at school. Greek souvlaki is the best. A friend of mine who went to Turkey recently said that they meat in Turkey smells so bad that she couldn’t eat lamb souvlaki. What a wonderful recipe with leftovers! This looks delicious Ivy – what a great way to serve leftover lamb! Great use of leftovers Ivy! You are making me drooling every time I visit your blog. Very creative way of using your leftovers! I did it! It was delicious! @ White on Rice Couple: Thanks for passing by. @ Laurie: Thanks, well I have been saying it for some days now that I will cut down the posts as it was very stressing lately. @ Cakelaw: Hey there, no more of that, now I am on a diet. @ Anamika: Take your time. @ Nuria: Great minds think alike. Hi Lulu, shall check it out. Hi Swati, thanks for visiting and I agree. Love lamb and your leftovers have been used in a very creative way! You mean there’s another side of you that isn’t good? I doubt that. 🙂 Thanks for playing along, Ivy. Sis, love all your recipes!!!!! I tried graviera when visiting Greece and wish I could find some in Canada! Hi Ivy, sorry I am very late in commenting due to my recent illness. Hey Rosie. No worries my friend. Hope you are feeling much better now.